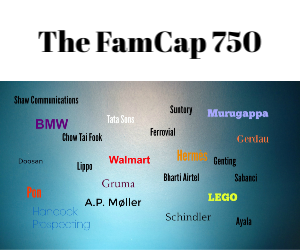 Family Capital has always followed a pro-wealth approach to covering its sector. We believe in the importance of global capitalism and think family enterprises help enormously in securing its future. But it is sometimes wise to point to issues that arise concerning wealth and responsibility, which, at the same time, isn’t being unduly critical of the sector. So, in this capacity, the rise of investment offices owned by the world’s wealthiest individuals and families is uncovering another level of responsibility. Private investment offices, family offices, principal investment offices, whatever they might be referred to have grown significantly in number and wealth in the last 20 years. With the onset of the new millennium, few even in high finance might have known what they were and if they did, wouldn’t have given them much thought. They were too insignificant 20 years ago. Today, it’s altogether a different story. The investment offices of the very rich are perhaps one of the most talked about parts of the investment world. Their numbers have mushroomed, and, although it’s difficult to put an absolute number on them given they’re unregulated, Family Capital reckons there are at least 3,000 of them, managing trillions of dollars of assets. Some think they’re many more. These days, many of these investment offices have immense influence in global capital markets, often more than some mid-sized institutional investors. They are exerting more influence in private equity and venture markets than ever before, and again, are eclipsing some institutional investors in these markets. Given their greater knowledge of private markets and even public markets, they stand to make huge returns on their investments – returns that the average investor can only dream about. Of course, these returns aren’t without risks, but, given the pool of assets they have at their command, they can afford to take these risks. For these investors, there isn’t a zero-sum game for their overall portfolio of assets. For the most part, much of society can tolerate these high returns, or at least, not rise up against them. The public can tolerate vast amounts of money being made by the very rich as long as there exist mechanisms for the average investor to at least prosper from investing in public markets. So, when the average investor sees their investments go up 10% or more in real terms a year, one is less likely to notice billionaires achieving 20%-plus returns in private equity in the same year. Or, at least, they aren’t going to feel as resentful as they might if their returns aren’t as good. And, of course, that’s been the case for much of the last ten years when public equity markets have boomed in much of the world, and the average investor has done pretty well. But, access to these public equity markets is shrinking because they are diminishing. An often cited piece of research from Credit Suisse shows just how much public markets are under pressure. Between 1996 and 2016, the number of listed companies in the US fell by half, to 3,600, down from 7,300. Also, the number of listed companies and initial public offerings in the US, the UK and the Eurozone fell to 100 in 2017, compared with 700 in 1996, according to the CFA Institute. It’s easy to see why some are saying today’s public markets, which came about in the 19th century, are not in tune with capital formation in the 21st century. Increasingly, capital formation now is about private markets, which only a select few have direct access to. OK, pension fund money is being allocated to private markets, but nothing to the same extent as to public markets, and even when allocations are high, returns aren’t necessarily as good as those achieved by general partners and private investment offices. More importantly, most investors don’t have the assets needed to access private markets directly. If you’re not classified as a sophisticated investor, you have to make do with the public markets. As a collective, private investment office might find themselves more in the public domain in the years ahead if the misalignment in capital markets gets worse. Resentment will inevitably build. Of course, there’s no obligation for private investment offices to disclose more information about themselves. As we’ve mentioned earlier, private investment offices aren’t regulated. And most private investment offices view direct regulation years away, if it happens at all. That might be true, but they also need to see how they are influencing the societies they invest in and realise the responsibilities that this brings upon them. To that end, they need to be more open about their role in global capital markets and help to formulate the debate about how markets can be more inclusive in the future. Because to do nothing and remain behind their anonymity might not be such a good option anymore as public markets shrink. Excellent piece, David, as ever. It all depends on what they should be more open about as they dont stand accountable to third parties and only manage proprietary money. If opening up is to share best practice to the extent it benefits the general public and can inspire others, why not.. Come meet some of our family office members in Luxembourg on March 19: http://www.lpeainsights.lu. Many are opening up, have websites and share investment tips with relevant audiences. You are absolutely right David. But opening up is not only the responsible thing to do, it is the smart thing to do. Professional family investment companies or family offices compete with private equity funds for both deals and people. And since we cannot and should not compete on terms, we must compete on values, and that is only possible if we become more proactively open.